Actually, just a pop quiz. Continuing the "flowers that look like Christmas ornaments" bit as started on our Facebook page…here’s another, as seen a couple of days ago in our visit to the conservatory at the Biltmore Estate, Ashevegas, N.C.
You can probably guess the family by the leaf shape. Let’s have some guesses, temperate-zone readers! This had me stumped, and I’m not unfamiliar with tropicals. And yes, I want one. Posted on December 21, 2012 Author Holly ScogginsCategories Friday puzzle, Interesting Plants, Perennials and Annuals7 Comments on Final Exam of 2012? Thanks to everyone for contributing! 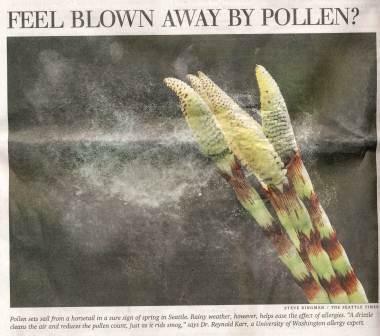 If you see EPEs in your local newspaper (that’s egregious plant errors), feel free to send them along for inclusion in a Friday posting! I can’t match Holly’s post for cuteness, so I’ll have to settle for constructive criticism. Below are photos that appeared in the Seattle Times earlier this week. Anyway, have fun! Answers on Monday. Friday quiz – what’s wrong with this picture? Posted on April 13, 2012 Author Linda Chalker-ScottCategories Diversions, Friday puzzle4 Comments on Friday quiz – what’s wrong with this picture? Terry E. for the win!!! Ray E. was heading in the right direction because he picked up on some family characteristics. As per Ray’s offering above, this species is in the same family, Commelinaceae, as the spiderworts, dayflowers, etc." To any plant i.d. students that may accidentally read this: family identification is important and helpful. The characteristic triangular flower shape (three petals) and six stamens is a dead giveaway (I get some guff for making them learn families). Plant photos taken at the Hawaii Tropical Botanical Garden near Hilo. Lush and gorgeous! We grow it as a tropical here, but it certainly doesn’t reach 6′ tall as in Hawaii. Easy enough to dig up and overwinter (and share with your friends – we got our clump from local plant goddess Elissa Steeves). Posted on March 12, 2012 Author Holly ScogginsCategories Friday puzzle, Interesting Plants2 Comments on Terry E. for the win!!! Well, I was swamped on my usual posting day, and now I certainly can’t top Jeff”s post – I laughed so hard it took away my initiative. "Throw and Go" indeed. I think we should start our own line of Garden Professors Soil Amendments – "Dr. Holly for Hollies," "Dr. Linda’s Flingable Compost (Not For Tea Dammit)", and "Dr. Bert’s Conifer Special". Dr. Jeff would have his own line of slug repellants and traps – available in six-packs. Back to my post… you get a quiz! I’ve rooted through my stockpile o’ photos and found one that just may fool a few of you. Or not. Tom Fischer for the WIN! The answer to last Friday’s plant i.d. quiz is Angelia gigas. Tom guessed it; confirmed (seconded?) by Johannes. Fairly easy biennial from seed. Bees and butterflies love it. This one’s a bit spindly due to too much shade (it had reseeded from another spot). And that most certainly is not a dandelion in the background. I love the buds – before opening, the flower is encased in bract with and disguised (?) with a wee leaf-like structure at the end. Posted on February 22, 2012 Author Holly ScogginsCategories Friday puzzle, Interesting Plants, Perennials and Annuals2 Comments on Tom Fischer for the WIN! Friday quiz – please try again! If you tried to post a comment/guess on the Friday quiz, you couldn’t…I gave the post the same name as a previous post, which somehow negates Sharepoint’s ability to accept comments. Linda kindly renamed the post – so give it another try! Posted on February 20, 2012 Author Holly ScogginsCategories Friday puzzle1 Comment on Friday quiz – please try again!